In order to accurately state my true feelings on the film, there are many spoilers in this blog post. I normally try to refrain from mentioning too many when I blog, but in order to get my point across about certain topics, main plot points must be revealed. This is a heartwarming drama from 1995 starring Richard Dreyfuss as a music teacher who aspires to be something more. This is the story of a man who has a loving, supportive wife but he wants to change the lives of those he teaches. At first, we are presented with a class of students who find it basically meaningless to memorize definitions from a textbook. Mr. Holland soon realizes that he must take charge and teach in a manner which will interest THEM as well as himself. From the beginning, we see Holland’s thoughts play out (no pun intended) and as he is seated at the piano, he jumps up to conduct the background music. At this point, we see the meaning of music in this film and in this character’s life. Music is not just a thing which exists in life; it drives HIS life which empowers him to feel greater than himself. I had seen this film previously but I had forgotten that it takes place at an earlier time period. The first few minutes will lead you to believe it’s 1995, when it was filmed, but as we pan to a scene of Holland pulling into the school with “1-2-3” by Len Barry playing in the background, we can figure out that this takes place in the 1960s. If the song did not give it away, then the skirts on the young ladies and dress shirts on young men would have been enough. The cast is multi-talented. Glenn Holland is played by none other than Richard Dreyfuss (and honestly, I do not know who else could have pulled off this role as remarkably and gracefully as Dreyfuss) who is well-known for starring in a large number of films including Jaws and Close Encounters of the Third Kind. Iris Holland, Glenn’s wife, is played by Glenne Headley. She has appeared in many television shows and films including the popular USA Network shows Monk (which unfortunately no longer airs) and Psych. Jay Thomas plays witty coach Bill Meister. He has also been in many television shows and films, including a portrayal of the Easter bunny in The Santa Clause 2 and The Santa Clause 3: The Escape Clause. Olympia Dukakis plays the warm hearted Principal Jacobs. Dukakis has appeared in a multitude of films and is a spectacular actress; she starred in one of my most favorite films of all time, 1987’s Moonstruck. Alicia Witt plays the outcast turned mayor Gertrude Lang. Witt played Zoey Woodbine in the TV series Cybill and Cheryl in a few episodes of Friday Night Lights among many other shows and films. We also see a great performance by William H. Macy, as well as by future stars Terrence Howard and Jean Louisa Kelly. 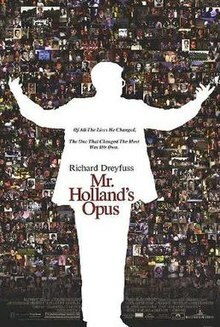 Mr. Holland’s Opus is directed by Stephen Herek. Herek directed the live action version of 101 Dalmatians, as well as The Three Musketeers (see my last blog post), The Mighty Ducks, and Don’t Tell Mom the Babysitter’s Dead among many others. He is currently in production of three other films as well. The mix of songs in this film is brilliantly put together and much enjoyed. From the London Metropolitan Orchestra’s “An American Symphony (Mr. Holland’s Opus)” to Mr. Holland’s emotional dedication to his son through “Cole’s Song”, every melody brings a piece of warmth to the screen. There are many dark elements to this film. We see some emotional, controversial conversations and desperate lack of communication between Mr. Holland and his deaf son. We also see the possibility of a friendship turning into infidelity, although that topic is so lightly touched upon that it is not worth dwelling on. Moments like these do not mean that this film is entirely of a serious tone. There is a moment after one of Mr. Holland’s unsuccessful days of teaching where he feels hopeless and his wife says to him “I made us $32 today.” He responds with “Big deal, I made 32 kids sleep with their eyes open.” For me, this was a laugh out loud scene. Another occurs during Mr. Holland’s summer job as a driving instructor, as he finds out his wife has had their baby. He is roaring through the city’s streets with two driving students in the car as one yells, “This is a one-way street, Mr. Holland!” They are scenes which my explanation of does not do justice for. There are powerful scenes throughout the duration of the film, two of which I will mention. Mr. Holland believes he cannot communicate with his deaf son and he basically refuses to learn for a long while. It is not until an altercation exists between the two which causes him to readjust his thoughts. One day when his father gets home from work, Cole asks him why he is upset. Mr. Holland shows him through his broken sign language that John Lennon has passed away, followed by informing him he would not understand. Cole flies off the handle, deservedly so, and scolds him through sign language that he does understand but that his own father will not take the time to understand HIM. This is a very gripping scene. Also, there is a point made in the film when a certain statement is made twice under very different circumstances. The line “your best is not good enough” is expressed both to Glenn from his wife Iris, and to the school board from Glenn pertaining to the removal of music education. 1.) The composer Michael Kamen was so inspired during the making of this film that he started a non-profit organization which would provide musical instruments to underprivileged students. 2.) Every person in the film who portrayed a deaf individual was deaf in real life. 3.) The song young Gertrude Lang learns on the clarinet is "Stranger on the Shore" by Acker Bilk. 5.) An actress by the name of Katee Sackhoff appeared as a child extra in the film. She claims to have hated it but starred alongside Richard Drefuss playing his daughter in The Education of Max Bickford. My favorite part of this film occurs in the classroom as Mr. Holland is sitting alone with Gertrude Lang. She is clearly upset at her lack of courage and determination. He asks her what her favorite feature is about her appearance and she responds by saying her hair, as her father says it reminds him of the sunset. Mr. Holland responds with “play the sunset.” She closes her eyes and comes out with a flowing, steady melody. This is not only a beautiful scene, but a huge turning point for her. Gertrude is my second favorite character in this. My first is Cole, the Hollands’ son. He is misunderstood but has such a wonderful soul. His character throughout the film is proof that those who are deaf can not only feel the music but they can appreciate music just as much as those who have the blessed ability to hear. Music inspires many of us and has helped us through many situations in life, whether it be classical, rock, rap, pop, etc. Perhaps this is why Mr. Holland’s Opus touches my heart in a particular way. It not only expresses how powerful music is to many people, but it also tells an entertaining story of how a man’s life completely changed due to how HE changed the lives of others. This is a wonderful story, and a film which I would absolutely recommend to everyone. We are the melodies and the notes of your opus. We are the music of your life.